Matt is originally from Chicago. He was the host of the Funky Buddha for the last 4 years, he also hosted weekend shows at the Improv and he’s known as one of the best writers in the South Florida Comedy Scene. I never thought that I wanted to do stand-up comedy. I went to the Funky Buddha all arts a couple of times. A friend of mine encouraged me to go so I said “F*ck it” so I wrote a couple of minutes. It went bad, but I started going it and decided to stick with it. 2) What makes you so awesome? 3) Who are your favorite comedians to watch (locally and nationally)? 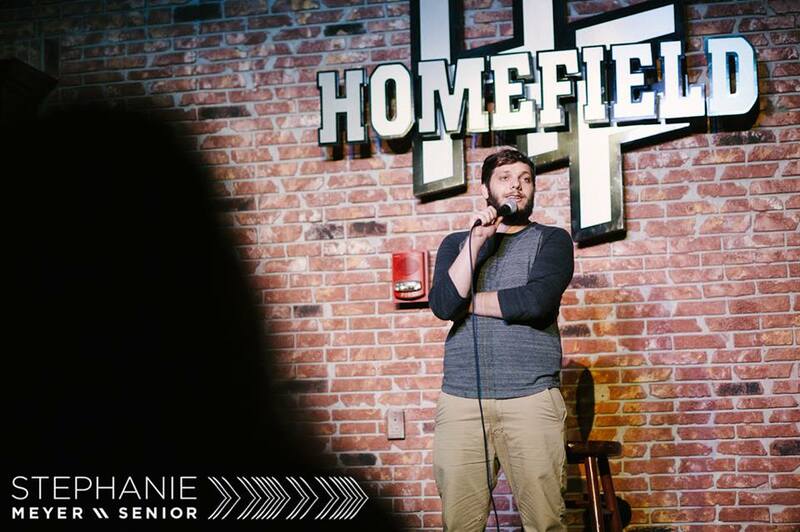 Locally: Mike Atcherson; he’s always coming up with new material and the kid doesn’t really miss often. Usually when he writes a joke it’s a hit. It’s great to see how comfortable he’s starting to get on stage. Tim Hanlon; he’s one of the best joke writers I have ever seen and he’s really funny in his delivery. You can see him do a joke and it’s fun to see how that joke grows and change. Franco; no one loves stand-up comedy more than him. He calls me at 3AM to improve his jokes. He’s always got something in his mind with stand-up comedy. Tom Segura; not only is he a great joke writer, but I can relate to the things that he talks about. He’s self-deprecating and willing to laugh at himself. 4) What types of foods do you enjoy eating when you have time to cook? Whatever leftovers my brother has in the fridge. 5) What do you love most about stand-up comedy? Before stand-up comedy I would go to a grocery store and be passive. With stand-up comedy I am always looking to see where the joke is. 6) Who is the person that you would want to hang out with (Alive or dead) and where would you take them? Mike Ditka; he’s just a man. I would just want to have a beer and cigarette some random hole in the wall bar and talk to him about football. 7) How do you write a joke? I don’t usually write it down as it comes out robotic for me. I want to keep it conversational. It has to be a true experience. A lot of my jokes are stories that really happened. You find the best way of telling a story with embellishing. I write a note in my phone and I will talk it out loud, rant over the original idea for 2-3 minutes and I will pick the key points to see if this is funny and then I will perform it, record every set and listen back to it to notice the finite things that will work or not work about the joke. The audience is always honest. Why did it work; why didn’t it work. It helps me learn a lot about myself and the theme. 8) What is your advice to being an amazing host? 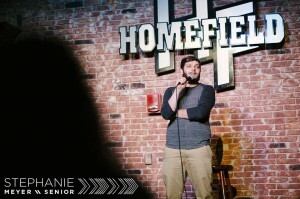 Hosting is a different skill set than being a comedian. The show isn’t about you. When you are hosting you are doing a job. Make sure it goes on time. Make sure they are listening. You have to let them know the rules. It’s your job to bridge the gap between the audience and the performers. It’s not about you; when you are the host you are the liaison between the audience and the show. Be upbeat, positive and always smile. You have to be likable. When you are the host you have to be the person that someone wants to get a beer with. Always put the show first. When I am hosting the night isn’t about me; it’s about the show. I will always put the show above the audience. 9) Why should people check you out at the Improv? Because it’s one of the best places to see comedy. There is always good shows. You will see some insanely hilarious headliner. 10) Why are you moving to NYC? To get funnier; It’s good to go to a big market such as NYC to see how you stack up.. I heard that it’s the boot camp of stand-up comedy. LA is great for movies and as far as stand-up comedy goes I heard the NYC is the Mecca. It’s a city where you can hit 50 mics a week. If you can grind and work your way up through NY you can do anything in comedy.